Player of the Year Votes are added as awarded by our panel - all votes are usually up to date by Tuesday. 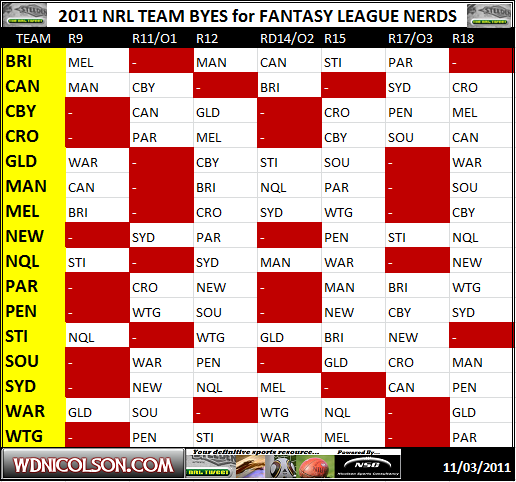 Fantasy League Leaderboard Updated Monday and Tuesday. 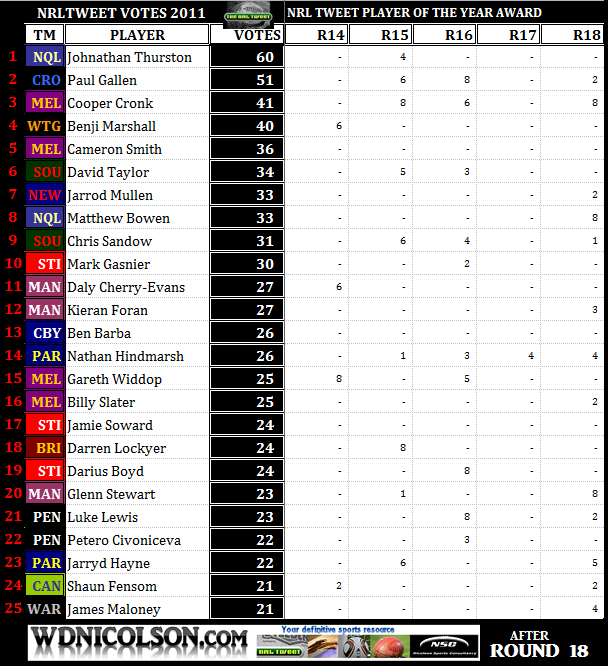 RD18 Votes to be added Monday and Tuesday. NRLTweet Game Summary: Warriors snap a 4 game losing streak with a 22-6 win over Titans in wet conditions in Auckland. Gold Coast lose their 12th game in 2011. On pure raw ability, one of the best players in the Comp. Showed his class all night but also rolled up the sleeves and got through some tough stuff. Has freakish speed and he caused headaches for the Titans defence every time he touch the ball. A workaholic who got through a mountain of tackles. Not that it's hard to defend against the Titans but the Warriors certainly look safer in defence with him in their side. Another great night with the boot, his kicking was accurate and he put in some long kicks which pulled up in the in goal when the Warriors needed field position. A strong return form injury with the expected huge work rate, Luck was a lynch pin in the Warriors solid 2nd half defence. Lead from the front, was strong in defence, made some big runs and scored a great try. NRLTweet Game Summary: Parramatta move Jarryd Hayne to five-eighth and looked slick early... Tigers have plenty of chances but Eels finish all over them 22-6. Whether or not his move to five-eighth will be permanent is anyone's guess, but Hayne got back to some of his best form in the halves against the Tigers. The veteran is dynamite anywhere but really shone at fullback with two linebreaks and a try assist. Handy with the boot as well. Didn't play big minutes in his first Origin, but tried his hardest in a struggling team with 100 metres and 40 tackles. The Eels finally broke through for a win after a month of great effort and no one stood out more than Hindmarsh. Made another lazy 49 tackles and backed it up with 19 runs for 125 metres. Is hitting to hurt lately. Loves playing at fullback and Hayne's shift to the halves allows him to get far more involved in a game. Made things happen when a half chance presented itself, made two breaks and set up a try. His first 20 minutes at five-eighth were sensational. Tapered off as the game went away from him but there is no doubt whatsoever the Eels look like they can score more points with him at first receiver on the left edge. The downside is you lose his kick returns and powerful running. An upside is he kicks the ball more often. NRLTweet Game Summary: Cronulla continue to play enterprising footy and all but end Canberra's season with a 26-12 win at Toyota. He is a big reason the Sharks have won 4 in a row. His kicking game has been very good and with his forwards giving him some space his decision making on the edges was equally as good. Played the whole first half and is a superb athlete for a front rower. Helped set up Wade Graham's try in the first half and finished with 20 runs and 32 tackles in 64 minutes. Despite his team making errors and giving up field position deluxe to the Sharks - this guy just kept fronting up. 50 odd tackles and 16 runs and even with the game over it was his pressure from marker on Gallen's field goal that forced it to go wide. Beautiful control of the game, his running game was on song with 106 running metres and he had a try and a try assist. Inspirational once again, made a mammoth 191 metres and took it to the Raiders forwards. Made 53 tackles and 99 metres, one of the few Raiders that can hold his head high. NRLTweet Game Summary: Melbourne keep themselves at the point end of the table by defeating Canterbury 28-18 at the Adelaide Oval. In everything, asked plenty of questions of the Dogs defence and kicked well to setup one try and scored two himself. Always dangerous at the back, did everything at 100mph and made a couple of long breaks. Made 35 tackles, 12 hitups and 121 metres. Did a lot of the touch stuff for the Dogs and they missed him when he was replaced. Went about his business as per usual and steered a seemingly tired Storm to victory in Adelaide. Provided punch up front for the Storm and was dangerous when shifted to the edges. Kept Canterbury guessing with his ball handling. 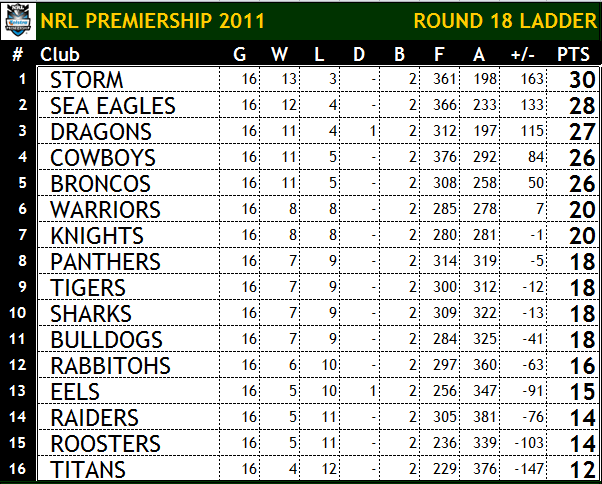 Had a good return to the top grade after a cup of coffee in 2010. The newest afro sporting Bulldog made 9 runs for 81 metres in his limited game time. NRLTweet Game Summary: How about the Sydney Roosters? Was their 34-26 win over the Panthers a sign they can revive their season or just a one off? Starting to find his 2010 form and was a menace for the Penrith defence. Busy game for Lewis, notching up 30 tackles, 140m, several offloads and a try. Linked well with his 5/8 Carney and his kicking game was top notch. If you didn't know better, you would think it was the Carney of 2010. He controlled play, scored twice and sparked the Roosters comeback. Looked like he hadn't missed a beat in his return and might find a permanent spot on a wing after a fine display filling in at fullback for Anthony Minichiello. Celebrated his 100th game with a win and despite playing second fiddle to Carney, produced a solid performance that included a few try assists. NRLTweet Game Summary: Strange game at a packed Brookie. Manly build a 16-4 lead, then Souths score 18 unanswered points but Manly still end up winning 36-22. Came into the game under an injury cloud and having played all 80 minutes in Origin 3. Worked hard in defence and attack. Was involved in several early attacking plays resulting in tries for Manly. Like his backrower partner Stewart, Watmough performed beautifully backing up from Wednesday night. Sparked his team by scoring 2 outstanding second half tries. His cut out pass to Oldfield was a thing of beauty. Worked hard all game despite a weak hamstring; offloading almost at will. Lead the match in terms of carries with 24 - impressive given his 80 minute performance in Origin 3. When the game was there to be won; Foran seized on the opportunity for Manly, and scored two tries to put the game out of Souths reach. Led the Bunnies resurgence and got them back in front. Unfortunately didn't have the quality of supporting cast to maintain the lead through the last 20 minutes. Kicking game was particularly good in testing wind conditions. NRLTweet Game Summary: How bout them Cowboys? Nth Qld overcome an out of sorts Newcastle 22-12 at AusGrid. Scott, Bowen, Segeyaro & Fe Fi Fo Fum outstanding. Lifted himself to fill the void left by the loss of Thurston. Drilled in some brilliant attacking kicks, pulled off some darting runs and was the thorn in Newcastle's side. Never stopped trying to do something for the Knights, especially following the injury to Kurt Gidley. Lifted the Cowboys in his first game against his former team. Capped off his night with the match sealing try. Took on the job of steering the Cowboys in the absence of his captain and did a superb job. Still plenty of class about him. Another powerhouse performance from the big man on the back up from Origin. Charged forward all night to get the Cowboys up the right end of the field. Continued his impressive start to his career with a dangerous running game in which he set up a try and a couple of line breaks.